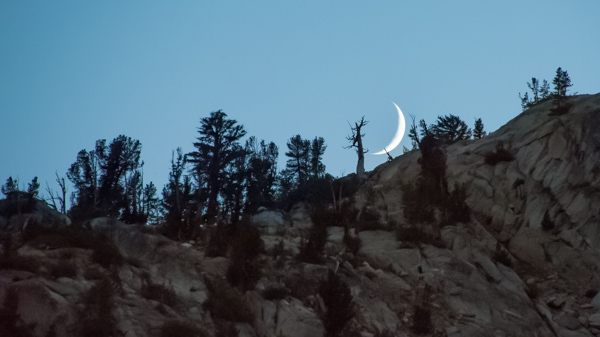 In part 1 of this series I described what I believe is the perfect alternative to a full John Muir Trail hike for those who cannot get the time off necessary for a full JMT thru-hike. The permitting is easy, the trail well marked and easy to navigate, and the 43-miles distance is over terrain just strenuous enough to provide a reasonable challenge and a sense of accomplishment when you exit the wilderness. In part 2 I tried to do justice to the beauty of the route with a photo-heavy trip report. In this last part I’ll recommend a three-day and four-day itinerary complete with campsite recommendations. I originally intended to hike this trip in three-and-a-half days, but ended up exiting the wilderness at Highway 50 by 4 p.m. on day three. That made for three 14-mile-plus days. I’m a 63-year-old hiker who is in good, but by no means great, shape. I carried about 22 pounds of base-weight, with another few pounds of food & water. Since my wife was driving me from our home in Reno to the trailhead, I didn’t get on the trail to 9 a.m. That is a late start for me. My first day’s hike took me from Ebbetts Pass to just pass Lower Sunset Lake. It was my intention to camp near that lake, and that was a mistake. 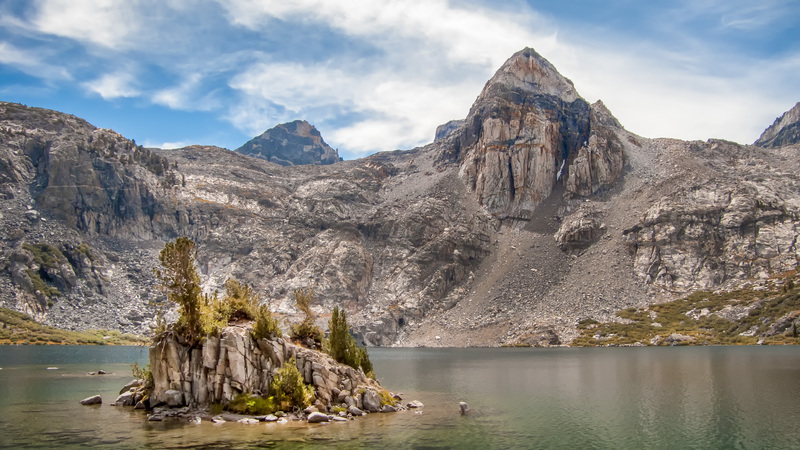 When I arrived at the two Sunset Lakes I found – for the first time ever in the Sierra Nevada – water that I did not want to drink. My purification strategy is to use a SteriPen, and while I have confidence that the water I would have treated would not have gotten me sick, it was full of small larvae and suspended vegetation of some kind. Oh…and it smelled. Both lakes are also difficult to get to because of the steep banks of the lakes. Once I reached the shore, I had to walk through several feet of mud. There is a campground adjacent to Upper and Lower Sunset Lakes, but it is dusty and unpleasant. There were a few car campers, and even an RV parked in the area. I ended up doing the best I could with water (had some left over from the day) and dry camped a little ways west of the upper lake. It was not a great site. The next morning, after less than ten minutes of hiking, I came across a lovely campsite on the east side of Lily Pad Lake. When I hike this stretch again, this is where I will camp the first night. Day two is a climbing day (see profile, above), but even with a 6:00 a.m. start, and a long lunch break near Lost Lakes, I still managed to reach my campsite, at Frog Lake, before 4 p.m. It wasn’t until the next day, when I visited the Wilderness Center at Carson Pass, that I found out that camping at Frog Lake is prohibited. (At least I think it is; the person at the Wilderness Center wasn’t sure, and there were no signs at the lake.) Instead, I would recommend you shorten day two just a bit, and camp before the climb over Elephant’s Back, north of Forestdale Creek. Day three will be a bit longer, but with a reasonable early start you should get to Highway 50 well before sunset. A terrific place to stop for lunch is Showers Lake. If you would like to liner a bit along the trail, or if days with less mileage is more your cup of tea, I would suggest camping near the small stream here on day 1. That should make for about a ten-mile first day. On day two, an easy 8 mile hike will get you to Lost Lakes. Day three will take you to Showers Lake, after about ten miles (see link, above), and day four will be your longest day, but with lots of descending at the end. As I mentioned in part 1, water was fairly plentiful along the trail in late August. Water was also available at each of these campsites, though – obviously – your experience may be different. I hope you have enjoyed this series and will consider this hike. It’s a good one! 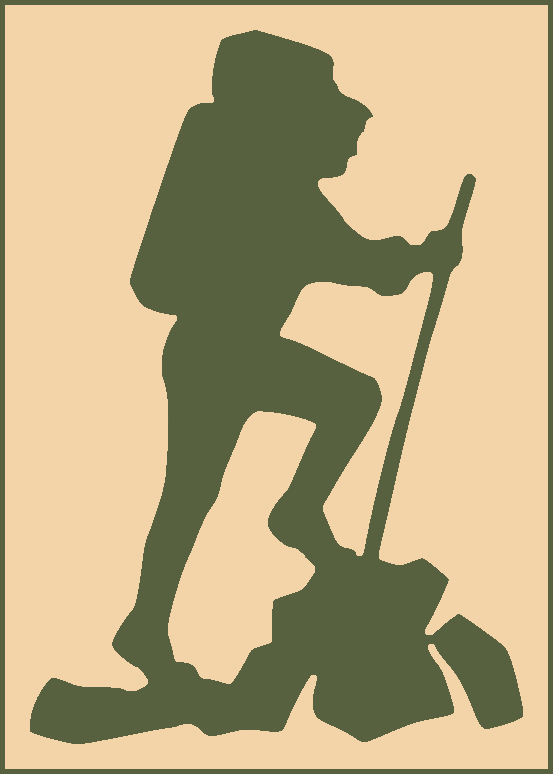 Hiking the JMT 2017? Here is what you should be doing, now. 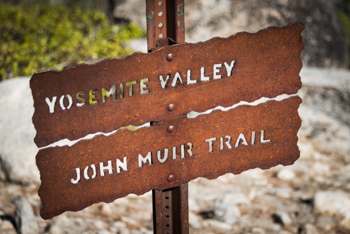 My next major John Muir Trail hike won’t occur until next year. Wrapping up a fifteen-year effort to write, publish and release a book; wrapping up my “day job” here on Oahu, and moving to our new home just north of Lake Tahoe and west of Reno is keeping this year quite busy enough. I’ve spent a lifetime dreaming of living near the Sierra Nevada. Skipping a major hike this year seems like a small price to pay to finally make it happen. We have about a week to pencil out an itinerary. We need to decide how much of the hike we want to do after Labor Day. If we decide to wait later in the summer we’ll see fewer hikers and mosquitos, but will have to contend with colder nights and potential transportation and accommodations issues along the way. Labor Day comes a little early in 2017: September 4. The JMT population falls precipitously after the holiday. I suspect we’ll settle on a start date around the last day of August or the first couple of days in September. That means the Tuolumne Meadows Grill and Tuolumne Meadows Lodge will still be open, and transportation to and from Red’s Meadow to Mammoth Lakes will still be in full swing, when we arrive at each. Although we can’t be assured of getting a permit on the day we want, at this point we are going to assume we will be stepping onto the trail at Happy Isles on day 1. We will need someplace to stay the night (perhaps two) before, so we must decide if we are going with the convenience of Curry Village, the comfort of the Yosemite Lodge, or the opulence of the Ahwahnee. Why? Because reservations there fill up quickly in all of them, and they can be made a year and a day in advance. We are planning a half rest day on day 3 in Tuolumne Meadows. If we want to spend a night in the Lodge (which is really a tent cabin), we’ll need to make that reservation a year and a day out, too. We are going to start discussing our permit strategy. There are two ways to approach this: try repeatedly for the date and place you want and then re-arrange everything else around the date you ultimately get, or make your reservations along the way and figure out a day and place to start your hiking so that you can arrive when planned. We will go with the second option. That means we need to carefully assess what permits are available, when, and we need to be prepared to request them on the first day available. Since one of our back-up plans is to leave from either Chiquito Pass Trailhead or Quartz Mountain Trailhead, we need to be ready a year ahead to request the permit. The last step isn’t absolutely necessary, but has the potential to help us avoid some unpleasant situations: we will start publicizing to our friends and family that we are going to be in the woods for three weeks in September next year. That way no one will depend on us being somewhere else! ~ Probably most important is the sunrise and sunset times. If you don’t carry a smartphone, there are a number of websites (e.g., this one) that will provide the times for the dates you are out there. Remember, it will get dark a little earlier in the evening and stay dark a little longer in the morning because of the high ground that will typically be to your east and west. ~ On one of my thru-hikes I carried a few sheets of paper like the one depicted above. Each of the four rows represents a hiking day, and since I was able to print this on both sides of waterproof paper, I got eight days on each sheet. On the left you see the sunrise and sunset data, as well as the total distance for the day, the elevation gain and loss, and the first and last waypoint I had entered into my GPS. 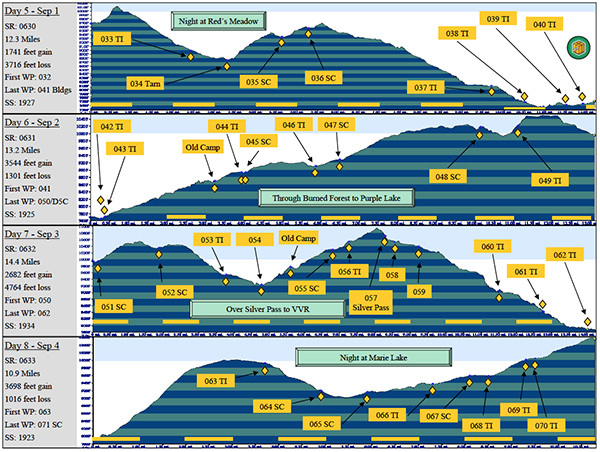 The main portion of the chart is the profile of the day’s hike, with waypoints and a distance scale at the bottom. Although I have since replaced this paper technique with a smartphone, it worked very well. ~ The last list of data worth keeping isn’t numerical, but is even more important. As you work through your planning you are going to come across areas or landmarks that interest you. You will be surprised how easy it is to walk past them without even noticing (e.g., the Red Cones, the Muir Rock, or the Donald Downs monument). Write notes about these places on your map or guidebook, jot a list on a separate piece of paper, or keep notes on your smartphone. Then, be sure to review the list the night before or the morning of each day’s hike. It can be quite disappointing, when reviewing your hike a few days after it concludes, that you forgot to look for something that grabbed your interest during planning. Marie Lake, your destination on day 10. I’m often asked to comment on itineraries. I’ll usually make a recommendation or two – I’ll suggest going a little further here or not quite as far there – but I’m reluctant to completely redo the trip. After all, the hiker presumably put some thought into the legs he or she chose. Who am I to judge? That’s not to say I’m not tempted. The problem with the itineraries for first time thru-hikers is that they are making decisions strictly based on mileage and elevation. They haven’t walked the terrain. They don’t know what they don’t know. What if I tore up “plan A” completely? What itinerary would I suggest for an average hiker wanted to successfully finish the hike with a minimum of pain and suffering, spend nights in scenic and interesting places, average around twelve miles a day (except for the last day), and work in some rest days and half days? If these objectives sound about right for you, consider this as a good start for your plan. I’ll do from Happy Isles to Muir Trail Ranch today, and Muir Trail Ranch to Whitney Portal next week. Day 1: Happy Isles to Sunrise Creek, ~9 miles. If you are intending to hike Half Dome (see last week’s post for more on that), then you are going to want to stop at Little Yosemite Valley. Otherwise, take advantage of your fresh legs, first day enthusiasm, and good breakfast to walk a little farther. Once you pass the Clouds Rest trail intersection, look for a small rivulet flowing across the trail, right-to-left. Its source is a spring less than 75 yards to the right of the trail, and there are some nice campsites near the spring. Plus, there are a dozen or so fewer bears waiting to visit you in the middle of the night than there will be in Little Yosemite Valley. Day 2: Sunrise Creek to Upper Cathedral Lake, ~ 9 miles. Is day 2 too early for a spectacular campsite? I don’t think so. Pitch your tent here, or, if weather permits, sleep under the stars. The alpenglow on Cathedral Peak as the sun sets will be amazing. Get on the trail early this day, so that you get to camp early and have plenty of time to explore, or just to sit and take it all in. Day 4: Tuolumne Meadows to Tarn below Donohue Pass, ~ 8 miles. Tonight is your first taste of life above the treeline. 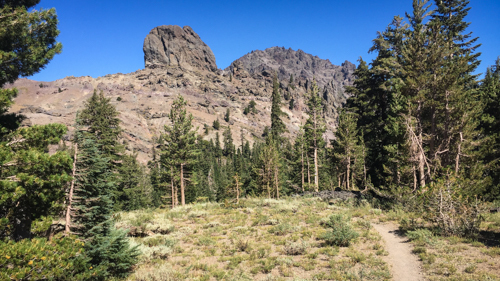 The hike up Lyell Canyon is a joy, and this campsite has great views, water – and even a little shelter from the wind. Best of all, you will be over Donohue Pass the next day before second breakfast. Day 5: Tarn below Donohue Pass to Near Garnet Lake, ~11 miles. It’s tempting to see the amazing photos of Thousand Island Lake and Garnet Lake and plop a mark on a map, intending to camp there. The problem is that legal campsites that are easy to get to are few and far between, especially near the lakes. If you walk past the outlet stream at Garnet Lake, however, you can find some smallish sites with amazing views – to the east of the trail. Day 6: Near Garnet Lake to Red’s Meadow, ~ 11 miles. After two nights in the woods, why not a break? Most of this eleven mile stretch is downhill, and it will culminate at Red’s Meadow. My recommendation is that you spend two nights here (or in the town of Mammoth Lakes), recharging, picking up your resupply box, and making gear changes based on your experience so far. Day 7: Rest Day. Stay off you feet, stay hydrated, eat well, and limit the celebration to a beer or two. Day 8: Red’s Meadow to Lake Virginia, ~16 miles. Yep…this is the longest day yet, but you are well rested and well fed, so why not? You will be climbing almost the entire day, but I’ve never found the climb to be all that tough. Lake Virginia is doable, even if you get a bit of a late start because you indulged in breakfast at the Mulehouse Cafe. (They don’t start serving until 7 a.m.) Lake Virginia has lots of nice campsites, and is gorgeous in the morning. Day 9: Lake Virginia to Mono Creek Bridge, ~14 miles. By camping at Lake Virginia, you will be up and over Silver Pass fairly early – probably before lunch. Then you will descend through some nice terrain to Mono Creek. I’ve heard that the camping rules around the bridge have changed, so be prepared to react accordingly. Stopping near the bridge will put you in a great position to tackle the 52 switchbacks up bear ridge first thing in the morning. Day 10: Mono Creek Bridge to Marie Lake, ~11 miles. Bear Ridge is, well, a bear, but your legs are fresh and you have some terrific scenery to look forward to. 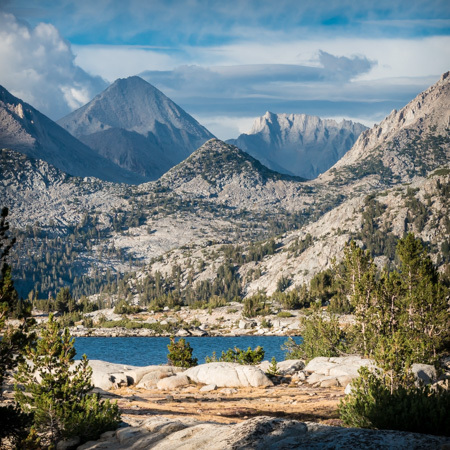 Tonight you will camp at what I consider to be the prettiest campsite on the John Muir Trail – Marie Lake. As you did on day 2, get on the trail early so that you can enjoy the late afternoon and evening at the lake. The next day is an easy one, so go ahead and push it! 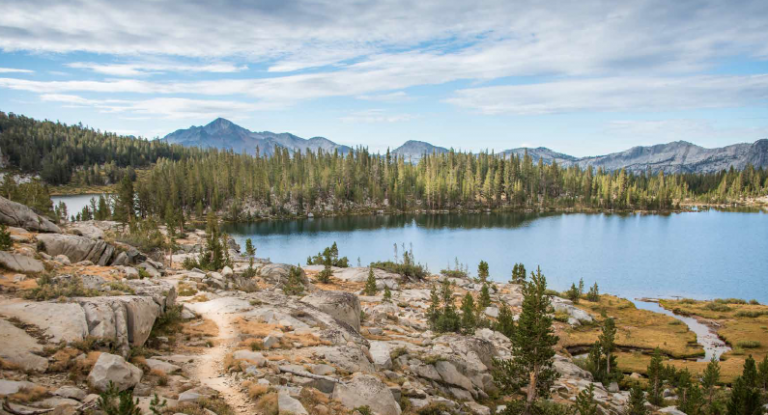 Day 11: Marie Lake to Muir Trail Ranch, ~8 miles. Even if you sleep in a bit, you should be to MTR by noonish. Since you have made reservations for two nights here, you will be able to take full advantage of the place during your half rest day (the day you arrive). Congratulations; you have made it half way. Day 12: Rest Day. Stay off your feet, eat well, take at least two baths in the opulent hot springs available to MTR guests only, and enjoy the books and great company in the library.